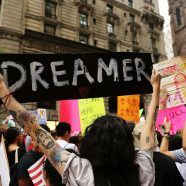 Although the title suggests otherwise, I don’t have any special knowledge about the fate of the Deferred Action for Childhood Arrivals program (DACA). But I believe that using a bit of logic it is possible to come up with a pretty good guess. First, realize that no law has been changed. Obama issued an executive order that simply kept immigration officials from enforcing existing laws on aliens who were brought here when they were children. Many of these kids are now adults. At no point were they given amnesty or made legal in any way. They may be called Dreamers but they are still illegal aliens. Now President Trump has rescinded Obama’s order (with a 6-month delay) so, unless something else happens, these illegal aliens will once again be subject to deportation by Valentines Day. The only thing that can stop this? Action by Congress. Now here is where the logic comes in. In most situations we have two competing views – raise or lower taxes, for instance. Congress debates and usually meets somewhere close to what the Democrats want (you thought I was going to say in the middle?). But in this case, the absolute most conservative position is to declare that the Dreamers are illegal aliens and subject to deportation. But, oh wait – they already are. This means that this is where the Conservatives will start, and any legislation can only move Dreamers toward legal citizenship. How far they go will depend on whether the few conservative members left in the House and Senate can keep them from going all the way to amnesty. Congress has proven itself pretty inept over the past, well, 50 years or so, and I hope that they will not be able to get anything done on DACA by the deadline. Unfortunately I am afraid that if they are faced with this prospect the deadline will simply be extended. And extended until we have 800,000 new voters.